Bridal Veil Falls is a neat desert waterfall located up Esperero Canyon, on the way to Mt Lemmon. It doesn't seem to be visited often, but is definitely worth seeing! The trail can be quite overgrown with desert grass. The grass has these "grass needles" that will work their way into trail running shoes (goes straight through mesh) causing you to stop every 5 minutes to pull the needles out! Hiking shoes might actually be useful on this trail. The season probably also affects how much grass there is. I was there in October. 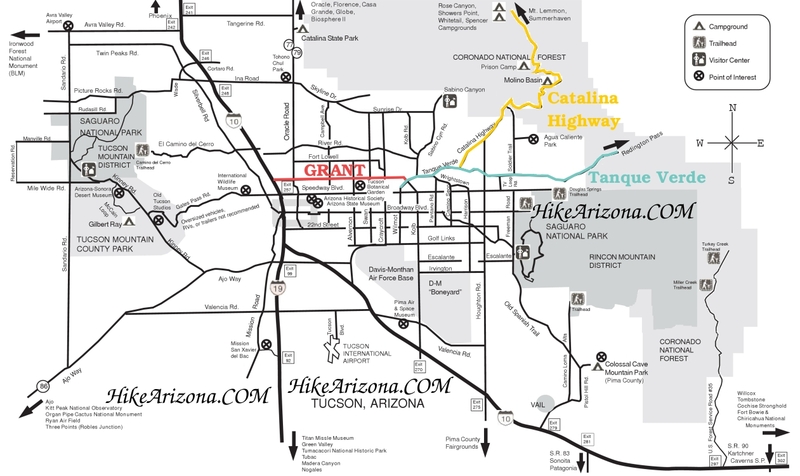 Most people will start from Sabino Canyon, which is the closest route to Bridal Falls. It's nearly 6 miles to Bridal Veil Falls, but the first 2 miles are quite flat. Then the majority of the elevation gain takes place between miles 2 and 4, with it leveling off again for the end. The trail can be difficult to follow at times due to the overgrown grass. It seems like not many people hike this trail. However, with some decent trail finding skills, you should do fine. Remember that when crossing creeks/washes, you almost always cross perpendicular to the creek. Trails almost never travel up washes/creeks. Look for the cairn on the other side of the creek. The trail has cairns at wash/creek crossings, but that's about the only cairns you'll see. As you near Bridal Veil Falls (like the last 1 mile), you'll be near running water. You'll of course need a filter. And I can't promise water will be running year-round. From the intersection of Tanque Verde and Grant/Kolb Rd head northeast on Tanque Verde. Turn left at the second light on Sabino Canyon Rd. Go about 8 miles up Sabino Canyon Rd and you come to a four way stop with Sunrise. Go straight through the intersection and take the next right into the parking lot of Sabino Canyon Recreation Area. Signs marking the way start on North Kolb road. This is the universal directions to Sabino Canyon Recreation Center. Hikes take off from all directions and some you might need to hike another trail to get to the start of your hike. Reference the hike summary for details.